This kitchen is both classic and contemporary at the same time. The door has a slight profiled frame and combines perfectly with granite worktops as well as with wood. Why not do a built-in extractor in the ceiling, creating the perfect open concept? 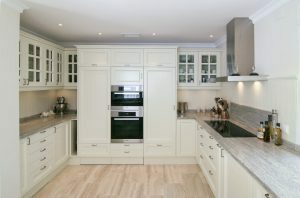 The same door is also used in a more classic inspired kitchen with beautiful tongue and groove wood panels on the walls – making this kitchen look outstanding. The appliances are integrated which gives a smooth elegant look.